William Harry (known as Harry) was born in 1899, the eldest son of William Harry (also known as Harry) and Florence Allen. Harry senior worked in the corn trade, as a porter and later a salesman and dealer. The family moved as his career progressed, from 1 Holly Banks, King’s Road (1901) to 1 Holme Villas, Hambridge Road (1911) and to Park Villa, London Road (1920s) and, eventually, to 277 Andover Road, Wash Common where he died in 1953. In his will he appointed Edwin Midwinter, a local corn merchant, as one of his executors, suggesting that he may well have worked for Midwinters and risen to a senior role in the company. When Florence died in 1955 she left effects of over £4500 showing that the family had come a long way from the days when Harry was a corn porter. Young Harry was educated at the Wesleyan School in Albert Road where he excelled and qualified for a scholarship to Newbury Grammar School. Following his schooling he spent some time in London before returning to Newbury to take a post in the office of local corn merchants and millers, Dolton & Son. It seems likely that his father’s connections helped him find his first job. On his eighteenth birthday Harry left Doltons to enlist with the Grenadier Guards. After training he was posted to their 3rd Battalion which was part of the 2nd Guards Brigade in the Guards Division. Harry would have joined the battalion in the field in the spring of 1918 at a time when the British and French Armies were in deep trouble as they faced heavy losses of men and territory in the face of the German Spring Offensive. Harry became a member of the battalion’s 1st Company (most battalions would have A, B, C & D companies, the Guards numbered theirs. As the German offensive ran out of steam the Allies regrouped and began to plan a series of counter-offensives. The Guards Division as part of the British Third Army (which was reinforced by the addition of the US II Corps) was to open an offensive against the Germans around Albert, which had been captured during the Spring Offensive. On 21 August 1918 the 2nd Battle of the Somme opened with an attack north of Albert, near Bapume. Albert was retaken on 22 August, on 26 August more British forces extended the attack north, by early September the Germans had been pushed back over 30 miles, their morale had been shattered and the end of the war was finally in sight. Sadly Harry was not there to rejoice in the unprecedented allied successes of that summer; he died in action on the second day of the attack, 22 August 1918. His body was buried at Hamelincourt British Cemetery; this was one of many small cemeteries closed after the war when the bodies of Harry and seven fellow grenadiers were moved to Bucquoy Road Cemetery, Ficheux where Harry now lies in grave IV.K.29. 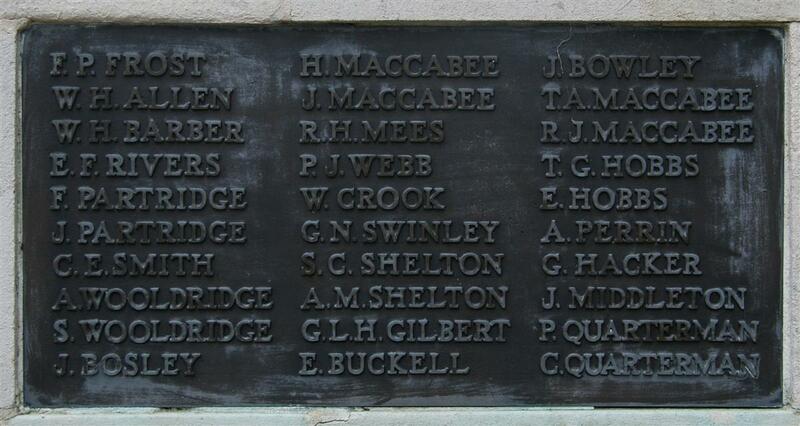 Locally Harry is remembered on Panel 2 of the Newbury Town War Memorial and on the Speenhamland Shrine, the splendid memorial in the URC church and the Newbury Grammar School memorial. After the war, relatives of the fallen were able to have an inscription added to the headstone over their loved one's grave. Harry's father chose Though gone from sight to memory ever dear. With 35 letters to be inscribed he was charged 10s 2d - at 3½d a letter he was actually undercharged ½d! Thanks to Karen Newbery for her help researching this casualty.